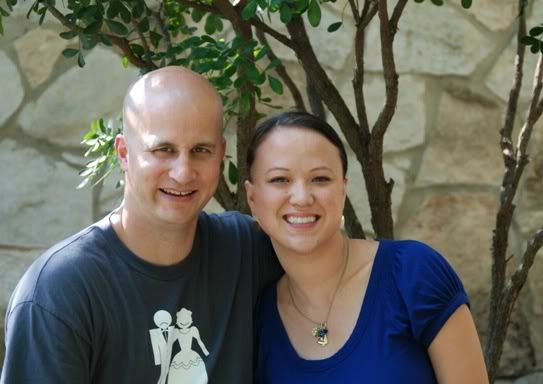 Two weeks ago, David and I spent a few days in San Antonio with our good friends Tim and Laura. The Riverwalk area is a romantic place to stroll hand in hand-- interesting people, delicious dining options (well, except for this one Italian place that was super yucky. note to self: stick with Mexican food when visiting SA! ), and picturesque areas to sit and relax. Look! David is smiling in this picture! :) He's not as mean as his bald head makes him look sometimes. When strolling about hand-in-hand in the aforementioned romantic Riverwalk, people smiled at us and were just super friendly. At first I didn't see the glances and smiles by complete strangers for what they really were. This one couple laughed and asked David to stop so they could look closer at his shirt-- that's when I KNEW. Hey, people think we're NEWLYWEDS!!! It would've been a-okay if this were due to how young or in love we look. But nope, I knew better than to think that. Wanna see the real reason?! 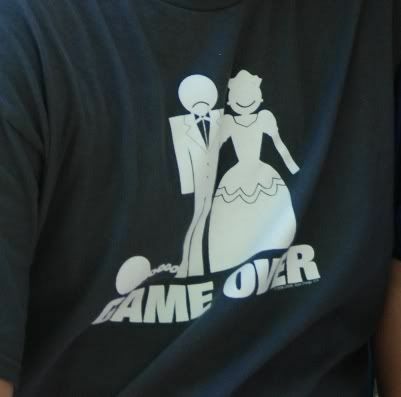 Yup, the old "Game Over" shirt given to him not by his old buddies back in the day, but from some certain boys at our church who know that David loves him some Xbox 360! How sad is that? It is kinda funny though. Especially how the groom is frowning and the bride is smiling. Great t shirt I have a friend getting married soon, can you tell me where your husbands tee shirt was orderd from. 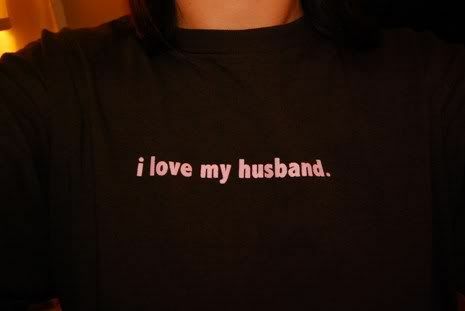 I love that shirt that says "I love my husband." :D You both look great.. that other shirt is hilarious..
im also wondering where that shirt was purchased...i bought one for my friends wedding a few months ago as a gag gift and there is another wedding coming up that i would like to buy this for and i cant for the life of me remember where i bought it. Helllpp! !